Public assessments of the Republican and Democratic parties have worsened over the last few months. 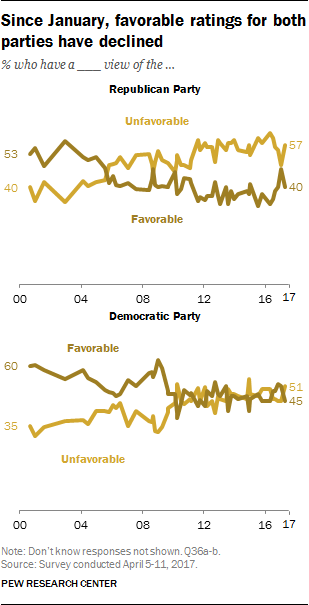 While the GOP’s image continues to be somewhat more negative than the Democratic Party’s, both parties are currently viewed more unfavorably than favorably. This is similar to their standing among the public this time last year. About three-quarters of Republicans and Republican leaners (74%) rate the GOP positively, little changed over the last several months. Just 15% of Democrats and Democratic leaners share that view, down eight percentage points from January but on par with other points in recent years. 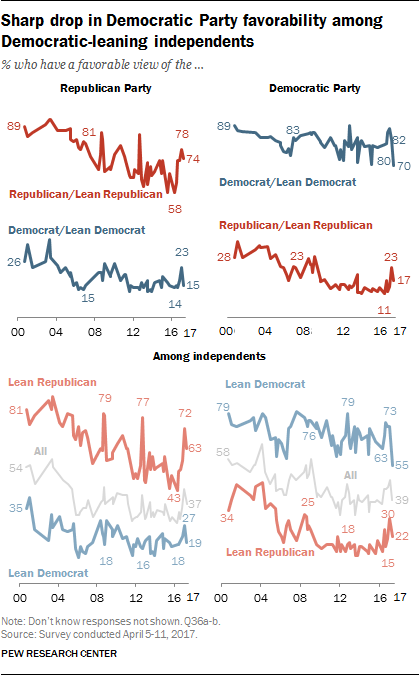 Seven-in-ten Democrats and Democratic-leaning independents (70%) now express a favorable view of the Democratic Party. However, these ratings of the party among its backers are now lower than at any point since December 2014, after the Democrats’ midterm election loss. As recently as January, 82% of Democrats and leaners held a positive view of the Democratic Party, and fully 87% did so in October. This decline is most pronounced among Democratic leaners. In January, about seven-in-ten (73%) Democratic leaners said they viewed the Democratic Party favorably; that share has fallen 18 points to just 55% today, one of the lowest ratings the party has received from its leaners over the last two decades. Republicans and Republican leaners’ ratings of the Democratic Party are also somewhat lower than they were in January (17% favorable vs. 22%). The current ratings are in line with other points over the last several years. 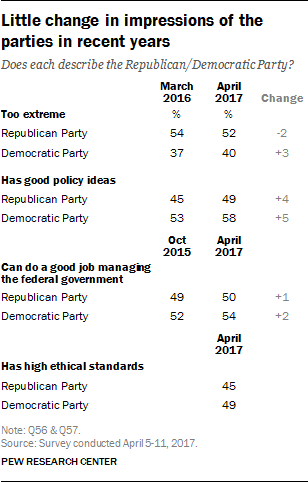 The public’s perceptions of the characteristics associated with Republican and Democratic parties have not changed much over the past few years. Compared with last spring, slightly larger shares say the Republican Party (49% today, 45% last March) and the Democratic Party have “good policy ideas” (58% today, 53% last March), but the Democratic Party continues to have an advantage on this measure. The public also remains more likely to characterize the Republican Party as “too extreme.” About half (52%) say the Republican Party is too extreme, while 40% say the same for the Democratic Party. Half of Americans (50%) say the GOP can do “a good job managing the federal government,” and a similar share (54%) says this about the Democratic Party. These views are nearly identical to views in October 2015. And roughly half (49%) say the Democratic Party “has high ethical standards,” about as many (45%) as say this about the Republican Party. The Democratic Party holds sizable advantages over the Republican Party on a number of major issues. More say the Democratic Party could do a better job than the GOP when it comes to dealing with the environment (59% to 28%), abortion and contraception (53% to 33%), health care (54% to 35%) and education policy (52% to 36%). It is also favored over the GOP on foreign policy (49% to 36%), immigration (50% to 39%) and government spending (48% to 40%). 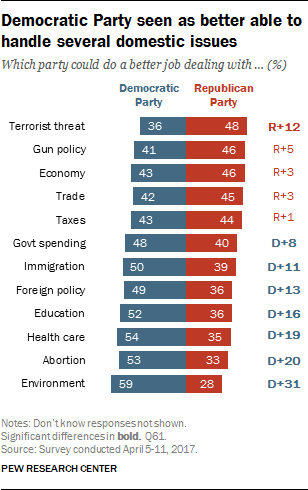 On just one issue does the Republican Party have a significant edge: About half (48%) of the public says the Republican Party can better deal with the terrorist threat at home; 36% say the Democratic Party could do a better job. Neither party enjoys an advantage on key economic issues: 46% say the Republican Party is better able to deal with the economy and 43% say the Democratic Party. Similarly, the public is split over which party would do a better job dealing with trade agreements between the U.S. and other countries (45% say the GOP, 42% the Democratic Party) and with taxes (44% say the Republican Party, 43% say the Democratic Party). When it comes to reflecting their views on gun policy neither party enjoys a significant edge among the public: 46% say the Republican Party does a better job of this, 41% say the Democratic Party. While public views of which party could better deal with the economy or taxes are little changed over the past year, views on which party is better equipped to handle trade agreements with other nations and government spending have shifted in recent years. The Democratic Party now runs roughly even with the Republican Party on trade, an issue on which the GOP enjoyed an 11-percentage point advantage last spring. And Democrats now have an eight-point edge as the party that could do the better job representing people’s views on government spending: 48% say this, 40% say the GOP. In January 2013, when the question was last asked, just 36% said Democrats could do the better job representing their views on government spending (the share saying the GOP could do the better job is little changed). The Democratic Party now holds a 13-percentage point edge as the party seen as able to do a better job “making wise decisions about foreign policy” (49% to 36%). This is the widest advantage on foreign policy the Democratic Party has had since August 2009 and reflects a significant swing on this measure from a year ago, when the Republican Party held an eight-point advantage (46% to 38%). The Democratic Party also holds an 11-point advantage over the Republican Party when it comes to immigration (50% to 39%); last year the public was evenly split on which party could do a better job on this issue (44% said the Democratic Party, 42% said the GOP). More Americans continue to see the Republican Party as better able than the Democratic Party to handle the threat of terrorism (48% to 36%). This balance of opinion is little changed in recent years. The Democratic Party continues to be preferred over the Republican Party by wide margins on several domestic issues: education policy, health care, the environment, and abortion and contraception. One exception is gun policy, on which neither party holds a significant edge: Today, the public is nearly evenly split between the Republican Party (46%) and the Democratic Party (41%) on this issue. The Democratic Party now enjoys a 16-percentage point advantage on education policy and a 20-point advantage on policies related to abortion and contraception, both little changed over the last few years. By a similarly wide 19-point margin (54% to 34%), more now say the Democratic Party could do the better job dealing with health care. Democrats have long had an advantage on this issue, but the size of the party’s advantage has widened. Americans continue to see the Republican Party as divided in its views on the issues and vision for the future: 29% say it is mostly united, while 68% say it is mostly divided. The share viewing the GOP as united has increased since the weeks before the 2016 election: In October, just 17% of registered voters saw the Republican Party as united. In contrast, the public is about evenly split over whether the Democratic Party is mostly divided (48%) or mostly united (49%). The share saying the Democratic Party is united has declined since the fall; in October, 58% of registered voters said the party was mostly united. While majorities of both Democrats and Republicans say the GOP is mostly divided in its views on issues and visions for the future, Democrats are far more likely than Republicans to say this: 80% of Democrats and Democratic leaners say this, compared with 57% of Republicans and Republican leaners; 42% of Republicans and Republican leaners say their party is mostly united. By a 58% to 38% margin, Republicans and Republican leaners think the Democratic Party is mostly divided. 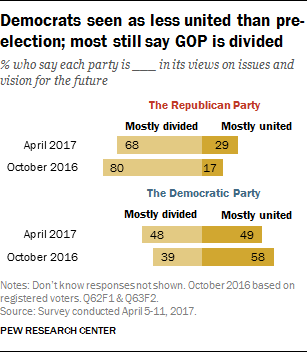 Views are nearly reversed among Democrats: 58% say their party is mostly united, 39% say it is mostly divided. 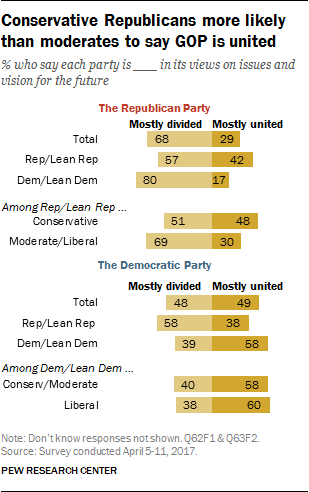 Conservative Republicans and Republican leaners are more likely than GOP moderates and liberals to see a united party: About half of conservatives (48%) say the Republican Party is mostly united; just 30% of moderate and liberal Republicans and Republican leaners say the same. No similar ideological differences are seen among Democrats. Roughly six-in-ten of both conservative and moderate (58%) and liberal (60%) Democrats and Democratic leaners say that their party is mostly united.